there is only one real industry on island (okay, three if you count drug and people smuggling, but let's not, hm?) and that is tourism. guam gets anywhere from 70,000 to 100,000 visitors a month visiting our sparkly shores, and of that, 85 to 95 per cent are japanese tourists (the rest is comprised of chinese and korean nationals, with a wee smattering of european and australian folk who are probably lost on their way to somewhere else). because of this, there is a definite japanese influence on many aspects of island life, not the least of which is the food industry. i live in the main tourist zone, the village of tumon (we live in villages! my village has high rises! ), which probably has more japanese and korean signage and businesses than english ones, and the highest concentration of japanese restaurants (36 at last count, all within walking distance). in fact, there are more japanese restaurants on island than any other cuisine (if you discount speciality fast food concessions and bakeries from the 'american' category, that is). i never really thought about it--it was sort of a given all my life that there were a crapload of japanese restaurants on island--but really, if you are japanese tourist on island, do you really want to be eating japanese food that is probably not as good as the stuff you can get at home? my informal survey of trying not to stare down the patrons of all the japanese restaurants i've visited produced evidence to suggest that perhaps no, they really don't want to if there's a tony roma's next door and $1.50 drafts. at the very best (restaurants and scenario-wise), maybe a quarter to a third of surveyed restaurant patrons are japanese, although not all tourists (the local population accounts for less than ten per cent--maybe less than five--of the total pop., although i don't know the exact number). i can only conclude that for the most part, most of the japanese restaurants on island are here to cater to us, the local folk. yay. we love our japanese food, yes we do. it's all about the j, baby. 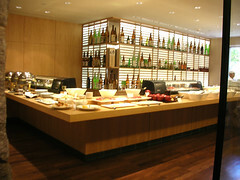 one of the most popular restaurants (j or otherwise) has got to be genji, in the hilton hotel. it was forced to close after a successful twenty-odd year run, when it was damaged by several supertyphoons; after extensive remodelling, it returned at the end of last year. 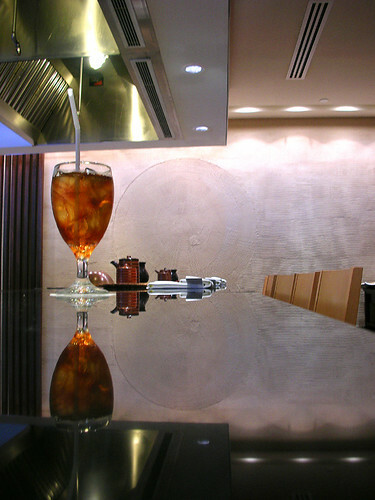 genji was one of the most popular teppan-yaki-style restaurants (teppan-wiki), but has transformed itself not only as a vast teppan-yaki emporium, but also a sushi, sake and shochu bar, with private dining rooms available. most japanese restaurants in the local hotels are well-populated, but mostly at lunch, as the dinner menus are exorbitantly priced; genji is no exception. the cheapest of the set menus is a local special at $45, and the rest can top $100 or so (read guam food guy's dinner review). i'm a bit loathe to pony up the cash for din-din, even if it might be an amazing food experience (hey, i've got payments), so like my friends and neighbours (who i always run into there), i opt for the lunchtime extravaganza which consists of one of a number of entrees from the grill or kitchen, along with an all-you-can-eat appetizer bar, dessert bar, miso soup, bowl of rice, and the obligatory unlimited supply of ice tea that i swear is making this island more hopped-up on caffeine than any coffee chain would ever do. all for the relatively reasonable price of $24. 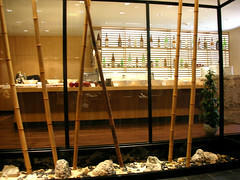 at lunch, the sushi/sake bar is cleared out to hold a good array of salads (green, pickled vegetable, and meat), sushi, sashimi, and a couple of hot appetizers like chawan-mushi (a savoury custard), fried meat bits (usually chicken or fish), grilled meat bits (also usually chicken or fish), and lately, a rather curious deep-fried sushi roll that is squiggled with generous squirts of tomato ketchup and kewpie-style japanese mayonnaise. i know they are probably hiding inferior grade tuna in those tempura-battered rolls, but the general rule holds true: deep-frying makes food tastier. if you are so inclined, you can eat your weight of this stuff, but local experience (myself and others) is that you should probably take it easy as the entrees tend to be generous; you can always go back (after the entree, and after the dessert, too). if you have never been to a teppan-yaki restaurant, this is what usually happens: you sit at a long bar that is fronted by a large stainless-steel grill (and hopefully topped by a very powerful but quiet exhaust system), and a nice asian man who acts as your cook/dining companion/mealtime entertainment. 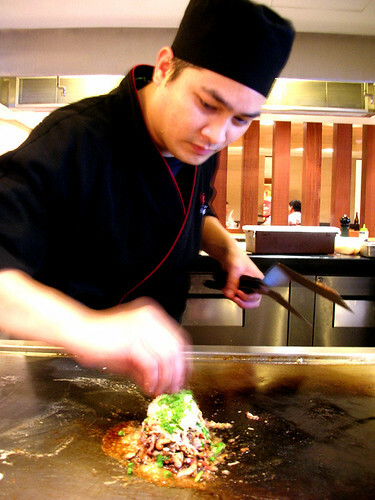 chances are that if you live in the mainland united states, you'll have more of a show than you would here, courtesy of the benihana chain; teppan-yaki is more commonplace on island, so folks would rather spend the time eating than hoping that cheffie inadvertently slices off an ear. 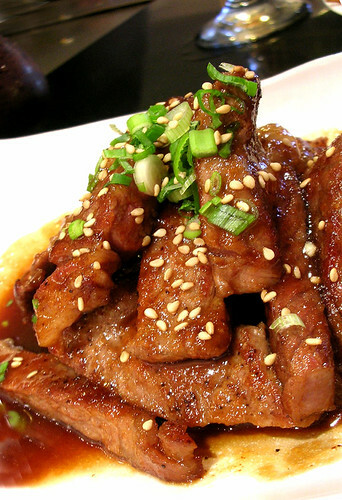 the grill is heated by powerful propane tanks underneath, and your choice of meat--usually chicken, steak, prawns, or fish--is sliced and diced in a butter/oil/garlic/sometimes onion combination, and plated alongside similarly treated bean sprouts and other veggies. this takes a matter of minutes, and is a relative fail-safe meal--it is very difficult for even the most modestly trained grill cook to eff-up a piece of meat and two veg. 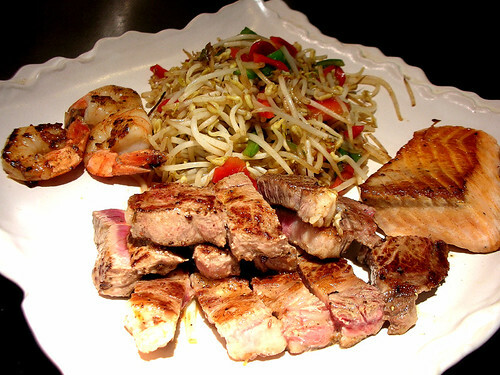 or, as the plate above shows, a medium-cooked rib-eye steak, several prawns, filet of salmon, and two veg. there is usually some sort of tempura set available to the non-grill lovers, along with other items from the kitchen. one of the most popular is the wagyu steak with japanese truffle sauce (wagyu-wiki). i don't think it's a sauce from japanese truffles so much as a sesame- soy sauce-based sauce laced with truffles. it is only very mildly fungal, and if it hasn't been oversauced in the kitchen, the main flavour comes from the meltingly soft, juicy beef. very delicious. 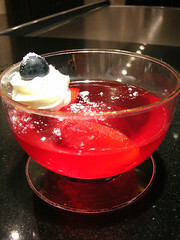 the desserts are curiously pallid and american, considering it's a japanese restaurant with mostly filipino and micronesian cooks, in a hotel reknown for its european baked items. the selection is almost always the same: assorted fresh fruit, a very custardy flan, apple or pecan pie bars, brownies, and the omnipresent red gelatin cup (i think there's only one restaurant in the whole hotel that doesn't serve this, but i'll bet they'd get you one if you asked). eh. there's always room for jello. and the brownies--dense, walnut-studded chocolate slabs further enhanced by a drizzle of chocolate sauce--are pretty darned good. on my most recent visit, it was at the tail end of the lunch service and not particularly busy. teppan-yaki guy was done with grilling my meal, and whether out of boredom, hunger or for practice sake, started pulling some interesting items out of the refrigerators below the grill--shiitake mushrooms, green onions, cream, parmesan cheese(! is there much call for parmesan cheese in japanese restaurants?). i asked him what he was making, and he said it was a florentine: a piece of rib-eye steak was sliced and cooked in typical fashion, but with the addition of mushroom along with the garlic/onion combination, then drizzled with a garlic butter cream sauce, and topped with parmesan and green onions. he so generously offered me a sample of his proclaimed fusion creation; it was delicious. now if it was only on the menu. 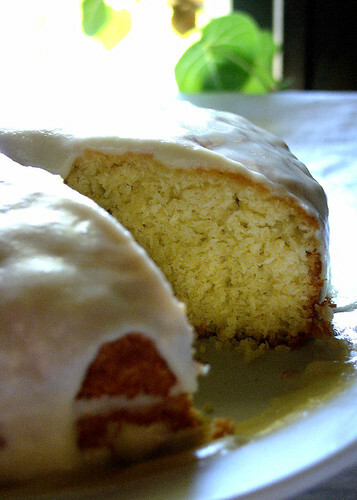 the coconut lime macadamia cake made from a recipe by bill granger. *whew*. all that from one very large bag of dessicated coconut. 'snowball' sounds so sweet in the winter, but now in the beginnings of a long, hot summer, it just sounds sort of dirty and nasty, like something a spoiled young celebutante would do to someone, do with someone, or do to herself. eat it, snort it, or ride it, baby--it's all good. fortunately, my little snowball has nothing to do with gak nor paris hilton, unless she has ally sheedy circa "the breakfast club"-esque dandruff, which looks too-alarmingly-similar to the teeny flakes of dessicated coconut that settle in a snowy pillow that refuses to diminish, and which is the object of my ingredient mini-obsession. not the sweetened, hairy, moist angel-like coconut flakes mostly found in the baking aisles of most american stupormarkets, but the unsweetened, chippy, dry, crunchy stuff that is usually found at your typical hippy granola store. or asian market. i love the stuff, there's a certain animal? vegetable? mineral? quality about it that makes me think i can use it as packing material, insulation, craft table supply, and yet still create the most delicious snack; versatility is where its at, whether real or really imagined. although i didn't stray from the dessert portion of the nutritional pyramid (where is that you ask? 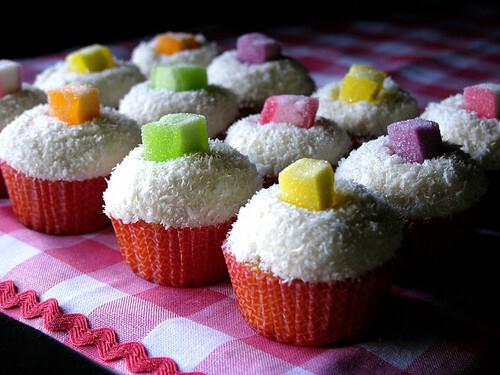 where do all sweeties and fatty desserts end up? on the bottom. ), i was rather pleased with the array. the macaroons were a semi-request from esa--he was looking for a recipe that would produce a moist, coconutty, cakey confection like something he had in egypt. most of the macaroon recipes i found online seemed like they would come out rather dry and biscuit-like; but, having recalled the macaroons i'd had in the philippines as being wet and chewy, i thought i would turn to one of my favourite pinoy bakers, celia kusinera. i often turn to her because, as a filipina, she understands the asian palate, but as she lives in the uk, she often uses western recipes and adapts them accordingly. as luck would have it, she had an ideal cherry macaroons recipe, which i only slightly adapted by using only half the stated amount of sugar, and omitting all cherries but the ones on top. i fiddled a bit with a bbc good food recipe for coconut cake, and came up with something rather more tropical tasting than i think the authors' had intended; this combined with the coco jam dulce de coco (might as well start now) resulted in a rather lovely sticky toffee-like pudding, rather neatly encased in a cupcake. served warm with a dollop of double cream as frosting and a bit of homemade coconut toffee, it was a decadent walk on the dark side that was surprisingly not oversweet, or overly heavy in the stummy. anyway, i'm not sure how the bill granger cake came into the picture, except after all that sugar, caramel and toffee--and the coconut frenzy still unabated--i thought that a bit of citrus would lighten the proceedings, and of course, stave off scurvy. the cake also appealed because there aren't any dairy products as ingredients, which i thought might result in a lighter cake, both in texture and calories (of course, i managed to ignore the bajillion macadamia nuts that make up the bulk of the cake). the texture is weirdly dense yet light, and the flavours quite subtle, although that improves with age. in this world of instant gratification, and downloads on demand, it's almost charming to find a recipe for a cake that improves in texture and flavour at least one day after it's made. not particularly something most people want to hear, but there are plenty worse things to listen to in this world. and the nenes today could use with a little more patience and subtlety, you know what i mean? and i, i have to lay off the drifts for awhile. add ingredients to a small slow cooker/crock pot set on low. stir occasionally to dissolve and to keep from burning; otherwise, keep covered with lid. 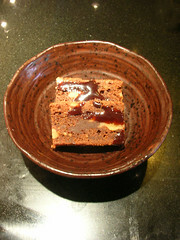 cook for 6 hours, or until the volume has been reduced to less than half and a thick caramel has formed. preheat oven to 350˚F. cream butter and sugar together until lighter in colour; beat in eggs. mix baking powder into flour in separate bowl, then fold into butter mixture. gently stir in coconut and coconut milk to form a thick batter. measure out batter into lined cupcake tins. bake for 20 minutes, then cool thoroughly. 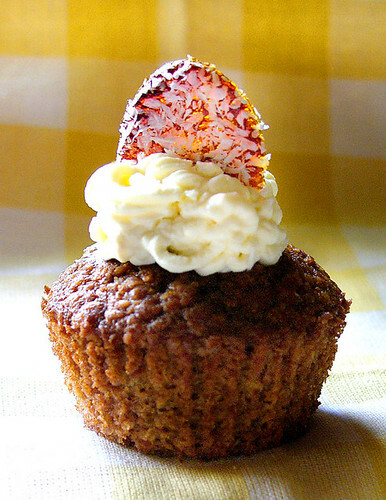 once cooled, use a pastry bag and filling tip to fill cupcakes with coco jam (recipe above), then top with double cream or whipped cream. oi, where did all the green mangoes go? 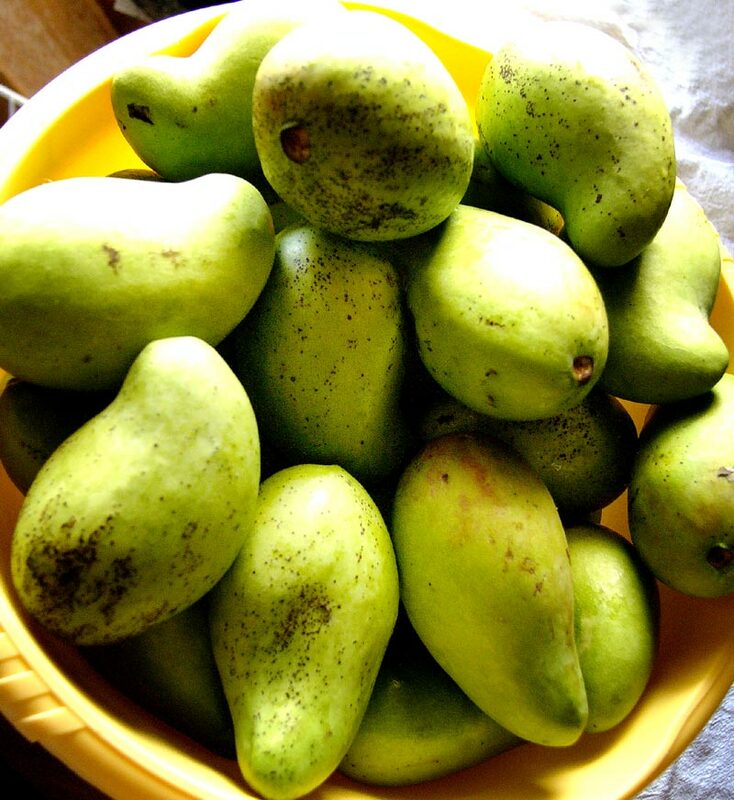 before i left on my little manila jaunt, we were at the height of green mango season--people were dumping bagfuls of these little greeny gems on my desk everyday, and i was like "hold on, cowboy!" i have a mountainful at home that are untouched, what am i supposed to do with all of these?! unfortunately, the fruit ignored my slothy slothiness and continued on their ripening path, so that by the time i was worked up enough to experiment with them, they were beyond ripe. sadly, the local variety of mango has a large pit and very little flesh, and what flesh is there is better somewhat unripe (the ripe fruit lacks the flavour of larger varieties we can get from hawaii, mexico, and the philippines). 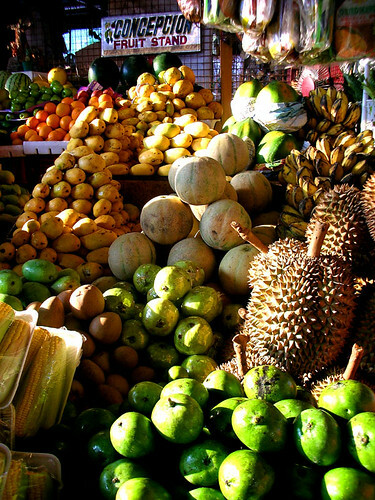 anyway, now that i'm back, the green mango mountain has disappeared, and the fruitful bounty (bountiful fruit) has ceased. damn, skippy. i was all het up with a fistful of recipes ready to go. luckily, i did manage to scrounge up enough fruit to try two new things for me. one was a green mango chutney, based on a recipe from madhur jaffrey's "quick and easy indian cookery". green mangoes were combined with green chilis, fresh ginger, orange peel and a bunch o' spices to make a sweetish, spicy compote. as i rather like the colour of the chartreuse mango flesh, i tried not to use anything that would interfere with the colour, but i still wanted to add maximum flavour to this indian condiment. as i cut down the traditional cooking time considerably, the ginger still retained quite a bit of bite, as did the mango. i could (and did) eat spoonfuls of this without anything, but i can imagine it alongside my next indian meal, or even as an exotic condiment to a well roasted chicken. heat a saucepan over medium high heat. add the cumin, fennel seeds, and mustard seeds to the dry pan. When the mustard seeds begin to pop, add the ginger. cook for about a minute, then add the water, orange zest and turmeric. bring to a boil then lower heat and simmer for 10-15 minutes. add the mango, salt, sugar, ginger, chili, and cayenne. 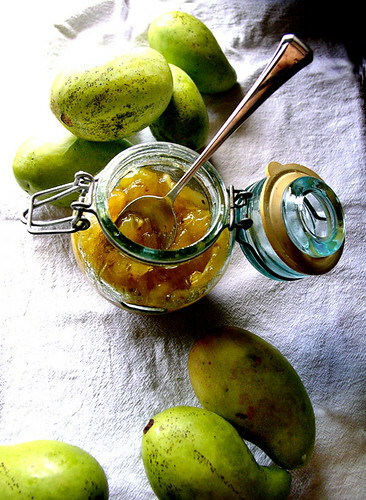 simmer for 15-20 minutes, uncovered, or until chutney has thickened, and the mango has become translucent. shred mangoes, then sprinkle the rock salt on them and combine. let sit for about a hour, then squeeze out most of the excess liquid from the grated mangoes. 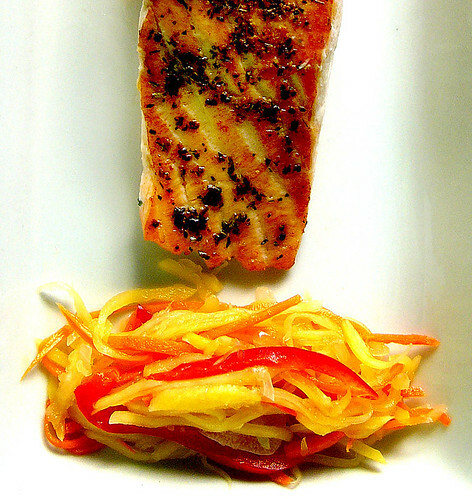 combine with the carrot and red sweet pepper; set aside. place the garlic, shallots, ginger, sugar and vinegar in a saucepan. bring to a simmer on medium heat, and cook gently until the garlic and shallots have become translucent, and the sugar has dissolved. take off of heat and cool thoroughly. once the liquid has cooled, add to the mango mix, and combine thoroughly. 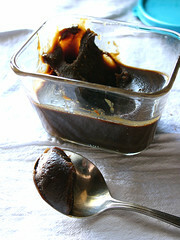 pack into a glass jar or dish and leave to marinate in your refrigerator for at least 24 hours before using. back from where the green banana met the curry leaf princess. back, back, back from the land of fabulous local dairy products, beautiful produce, disastrous haircuts and a brief encounter with a german biker, and lovely native lasses who bestowed me with a bouquet of curry leaves. yay, curry leaf princess! i've been looking for those. 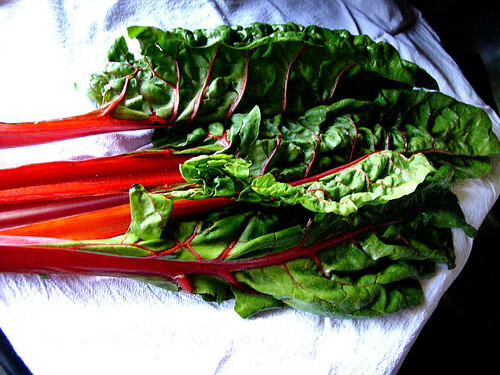 ah the heartiness of chard-iness. i knew this woman who said the only vegetable she could cook was chard; even then she could only stir-fry it. i knew enough to completely ignore that, and decided that if the darned thing was named after a provençal word, i should probably look for a provençal recipe, which in my recipe universe means i should look in my british cookbooks. so i did, and quite fortuitously, there were a couple of french recipes in my latest purchase, "new penguin cookery book" by jill norman (no penguin recipes, however). ms. norman also provided some helpful cooking hints, the most interesting being that stalks and leaves of chard are generally cooked separately and used in separate dishes as well. i don't really know why this is as i come from the chop-and-stir-fry school, but perhaps it's more of a texture thing than a flavour thing? i didn't notice a difference in the flavour of the stalks compared to the leaves. 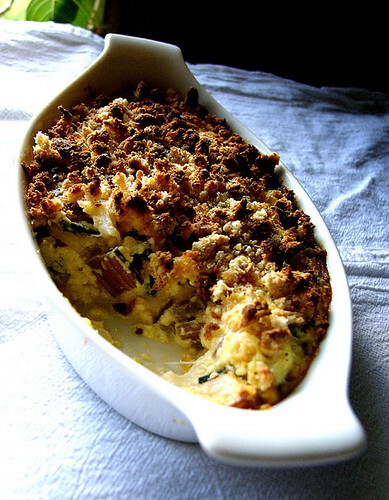 i chose a provençal gratin made with the chopped stalks of chard sautéed with onion and garlic, then covered in a sauce of beaten egg, heavy cream and grated parmesan flavoured with nutmeg, then covered with a layer of (wholegrain) breadcrumbs and baked until bubbly. this dish did absolutely nothing to enhance the flavour of the chard, but when confronted by a richy, cheesy, almost custardy flan covered by a crunchy, carby coating, i don't think most people would care. the chard was there mainly for texture, and to also remind you that vegetables are an important part of your diet (again, when i say 'you' i mostly mean 'me'). this was quite good, but made me think that french people don't know wtf to do with chard, either. as i now had to tackle the greeny bits, and had a belly full of breadcrumbs and dairy, i decided to look for a completely different option. it easily came from my second-to-latest cookbook purchase, "simple indian" by atul kochhar, which was recommended by the inimitable j. i used the leafy greens as a substitute for spinach in a recipe for china bodam diye lal saag, a dish from calcutta. 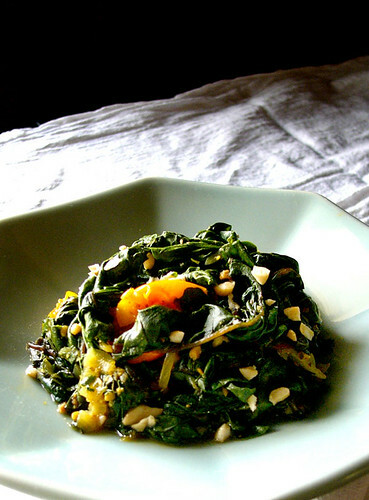 the chard leaves were gently torn up, sautéed with garlic, onions, tomatoes, and crushed peanuts, until just wilted, then flavoured with coriander seeds, dried red chili, turmeric, and mustard oil. the chard stood up well to the spiciness and almost mustiness of flavours, and the faint bitterness of the dark greens complemented them well.